I will always have a soft spot in my heart for Christmas lights. When I was a child we would drive around North Jersey when visiting my grandparents. We were headed towards THE Christmas house in the area. A couple of architects put on one of the most spectacular home displays I have ever seen. Every year it would get bigger and more impressive. They stuck a can out front for donations to help pay the electric bill. Parking was impossible. We normally just did a very slow drive by to witness that year’s spectacle. We were never disappointed. 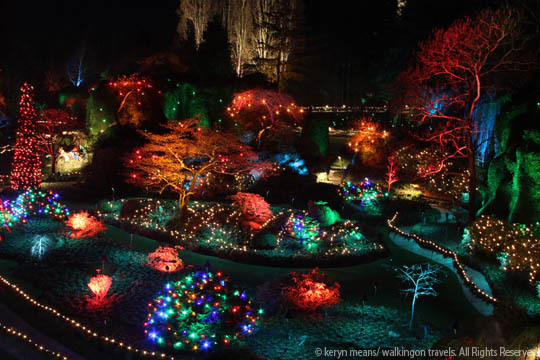 Is it any wonder that I was a giddy little kid when we entered Butchart Gardens this past weekend to see their Christmas light display. I had read all about the and knew it was one of the best around. We knew it would be a splurge to go, but to me it was worth it. 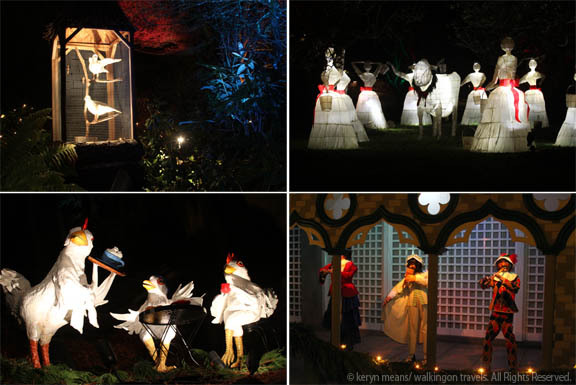 Nothing could have prepared me for the careful planning and attention that was paid to the theme…the 12 Days of Christmas at Butchart Gardens. 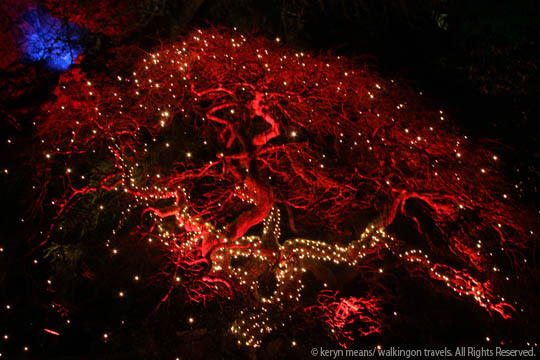 Signs point you to the start of your self-guided tour through the 12 Days of Christmas at Butchart Gardens. A Partridge in a Pear Tree was easy to spot, but it can get more complicated from there. Half the time I was so enamored with the actual display that I forgot there was a theme going on at all. It took me 5 more days of Christmas to realize I had seen Three French Hens. Heck, I thought they were just creepy chickens with the Eiffel Tower behind them. Dek certainly thought they were weird looking. Four Calling Birds chatting on cell phones was definitely a new take on this classic Christmas carol. It was almost a game trying to spot all of the Days at Butchart Gardens. We definitely did not do them in the right order. With a stroller in tow we did half of the tour backwards as we took the handicap access ramp. This is how most visitors exit the Sunken Garden with at least 5 of the days set up inside. Ah well. It’s more fun to explore on your own and in your own way. We like to go against the grain (or in this case the flow of traffic) sometimes. 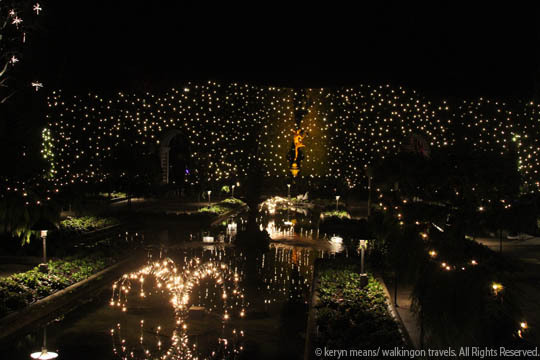 The Sunken Garden housed some of the best lights of all. Climb on down and explore. Dek had a blast running around Butchart Gardens, pointing at lights and water displays. His favorite stop was the carousel. 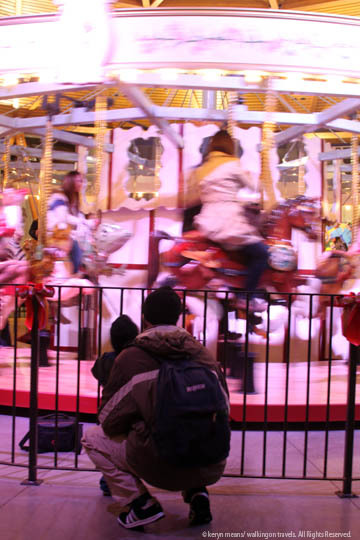 Since he had just ridden his very first carousel the day before in Seattle he knew what was in store. I let Mike take him on. There was no question in Dek’s mind that he would be riding the whale. Who needed a horse or giraffe when you could ride an orca! Giggles, smiles and squeals could be heard as my two boys went round and round. Surprisingly Dek was one of the only children on the carousel. Most were adults. Christmas really does bring out the kid in all of us. 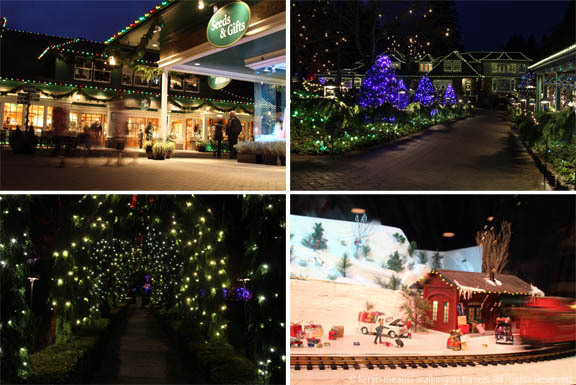 As we made our way out of the 12 Days of Christmas and back into the buildings of Butchart Gardens we had to make a decision. Did we take the early bus back and hope Dek could make it through dinner or did we eat something at the garden. We opted for the garden. Dek had been pushed hard enough that day. We were all cold and could use some food to get us home. This was one of our wiser moments in travel. It might have cost more, but it was worth it. We had saved so much by taking the bus we could splurge a little on a surprisingly decent meal at the Blue Poppy Restaurant. 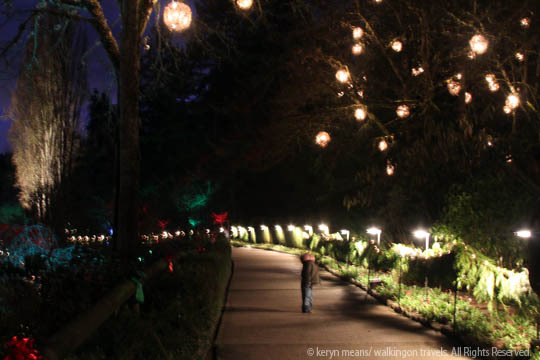 When we left the 12 Days of Christmas at Butchart Gardens I couldn’t help but look back. If only it was warmer, if only there was more time, if only we weren’t all so tired, then maybe we could have stayed longer to ice skate, shop, or sit on a bench and listen to the carolers. It wasn’t in the cards for us this trip, but next year it certainly will be. Same Day Reentry: if you would like to reenter the park again on the same day, be sure to have your hand stamped before your departure and have your hand and ticket ready for reenter. You have three options- a tour bus, a rental car or the city bus. We chose the city bus because it gave us more flexibility and was much cheaper. Tour Bus- you can book a package with your hotel, on the Victoria Clipper or online through a number of tour operators. The package will include a charter bus ride up and back to Butchart Gardens along with your entrance ticket. Cost is around US$55 per adult. Children under 5 are free. Rental Car- you can rent a car from Budget rental for about $50 a day and drive yourself out to the gardens. Parking is free. Public Transportation- This was the best option for our family. We could control the times we came and went. It was also a lot cheaper. $2.50 per adult each way (total $10 round trip for 2 adults.) Bring exact change with you. The bus driver has no cash on hand. Easiest bus route out to Butchart Gardens– take the No. 75 bus from Fairfield at Blanchard just a few blocks behind the Fairmont Empress. Ride the bus all the way into Butchart Gardens. Do NOT get off before you are in the park. It’s a long walk between stops. Check the schedule at the Gardens information center for the best time to leave. Easiest bus route back to downtown Victoria– take the No. 75 bus from Butchart Gardens. You will catch the bus at the same spot it dropped you off. After 6pm there is no direct No. 75 bus back into town. However, your bus should turn into a No. 6 bus after the Royal Oak Exchange stop. So stay on the bus you picked up in the garden! You will be dropped off at Quadra and Yates, just 6 blocks from the Fairmont Empress and a very easy walk to your hotel. Dress in very warm layers. Bring a stroller or baby carrier. Little legs will get tired and cold after so much walking. Ticket scanning at gate: this may sound simple, but lots of people were having trouble when we entered. The turnstile ticket taker does not actually take your ticket. Simply place the top barcode in the center and it will read. The turnstile will unlock and you can go through. If you keep trying to get the ticket accepted into the machine it will void your ticket because it thinks you already used it. Go to the ticket counter for help at that point. Bring a tripod. 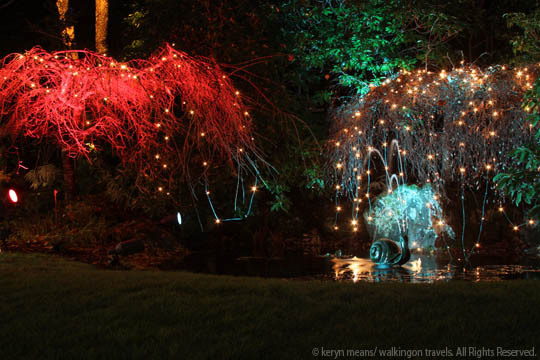 It’s the only decent way to capture the magic of the 12 Days of Christmas at Butchart Gardens. Wear fingerless gloves with a mitten top. This type of glove makes it easier to change camera settings, shoot on the fly and grab a snack out of your bag for a tiny bellies. Don’t expect perfection. Nighttime shooting is tough. You either get blurry shots from not using a flash or a really bright flash on your family’s faces but not much of the twinkle lights in the background. That’s OK. Just capture what you can and enjoy it. The experience is much more important than the digital picture you capture. 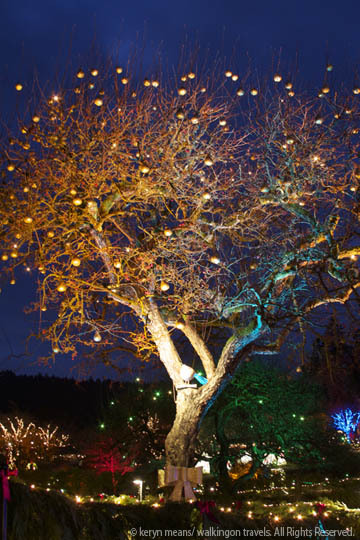 A Partridge in a Pear Tree kicks off the 12 Days of Christmas tour at Butchart Gardens Christmas celebration. I am so jealous. You are in the part of the world I wish I was – if only because my daughter is just across the way in Vancouver. But only 10 more days….til she’s home for Christmas. It is wonderful to read about your adventures. Your family certainly knows how to experience the world and the wonder of one another’s company. enjoy! What a Great Experience and a Theme to boot – love it! We have a neighborhood that we explore for the lights and displays – one year they were handing out candy canes. I enjoy looking at the lights and decorated trees this time of year – oh so festive and makes your spirits bright and merry – ha! Thanks for sharing. 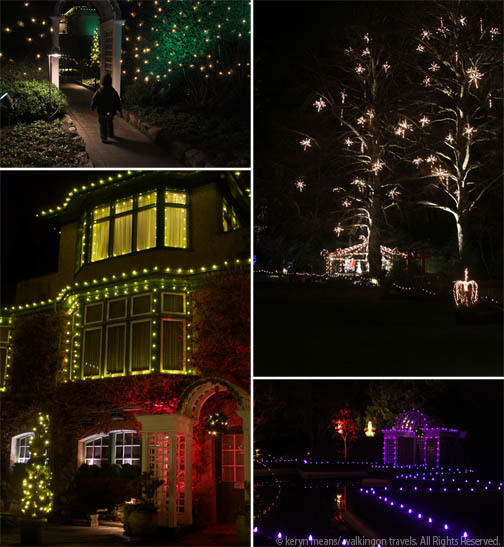 It looks so beautiful – Dek must have loved all the lights! I don’t think that I’ve ever seen a carousel with a whale – how unique. I want to go on a trip with you so you can teach me how to take all those awesome pictures. Very, very nice! Ha ha ha! You find us a trip and I’ll be happy to come along.